I learned a lot during my time at the Midwest Writers Workshop this summer. 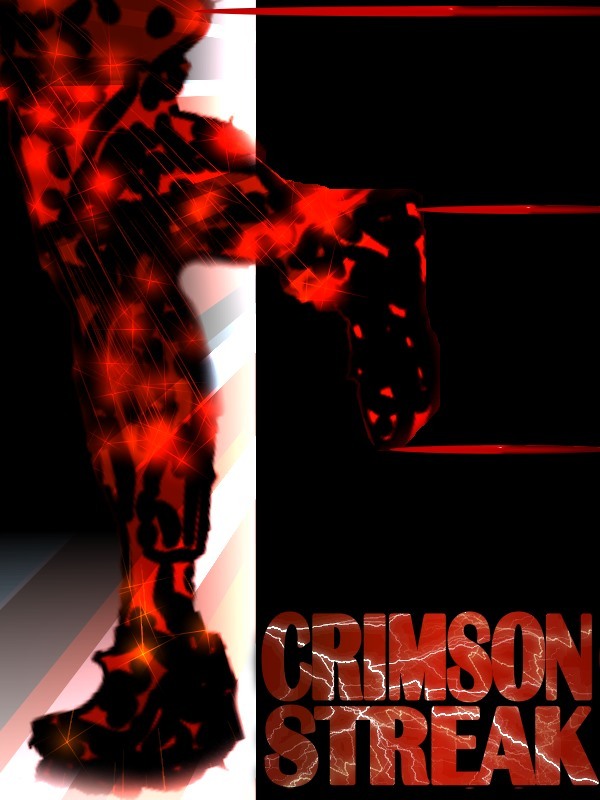 But one of the most interesting stories came from author John Gilstrap (his website here). His first book, Nathan's Run, ended up being a big seller. But his original title for the book was Nathan! with an exclamation mark. I didn't add the exclamation point for emphasis...Gilstrap revealed that he actually wanted it there. But the powers-that-be didn't think that was such a good idea and thus, the title became Nathan's Run. Probably a good idea for all. 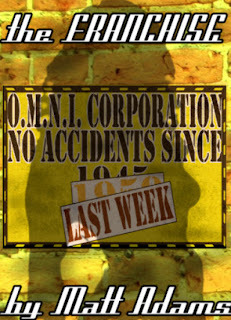 He also mentioned that the title of his current book, Hostage Zero, has practically nothing to do with the actual plot. And then there's Marcus Sakey (his website here), a successful author of crime fiction. Sakey talked about book covers and how authors have no control over them. You may have a great idea for a book cover, but there's about 1% chance that the publisher will come up with anything remotely resembling what you had in mind. He says it will be something completely different...and don't expect the art to have much to do with what your book is actually about. I bet many writers will find those bits of information disillusioning. After all, you've given birth to characters and new worlds. You've created these plots and people from NOTHING, pouring all your heart and effort and soul into them. You feel that no one has ownership over these things except for you. But do you want anyone to actually read your work? Would you like to maybe make some money off it? You can self-publish...a practice becoming more and more acceptable...but there exists a stigma that self-pubbed work is of lesser quality because there's no gatekeeper (i.e., a publishing house) involved. I could literally write 70,000 words of ampersands and percentage signs, slap a cover on it, and put it up for sale. There's no control there. So if you want your stuff to get read, your best chance to reach wide audiences is to have a publisher do your book for you. That means getting an agent; that means signing over the rights to your work to someone else. And so that's why things like Nathan! never make it out in the marketplace. Of course, publishing is changing greatly and mightily...and those publishing houses are losing some of the control they worked so hard to get. But if you want your books in the major bookstores (as long as they exist, of course, and that may not be as long as you think according to this article), the big publishers are the way to go. So, goodbye clever, blood-sweat-and-tears title. Goodbye, killer-concept-for-my-cover-that-will-sell-a-million-books. I've written before of crappy Photoshopping. 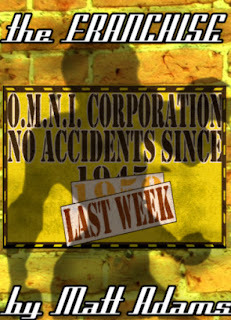 It's one of my favorite blog labels for any post that involves something I've cobbled together using photo-editing software. In my wild, younger days of new authorship, I dreamed of seeing the cover I designed on bookshelves. So I produced different versions of covers for my books, most notably I, Crimsonstreak and The Franchise. Since the world isn't likely to see these covers in reality...when my books hit big, they'll have a professional artist do something masterful that relates in no way to the plot...I thought I'd share some of my concepts with you. 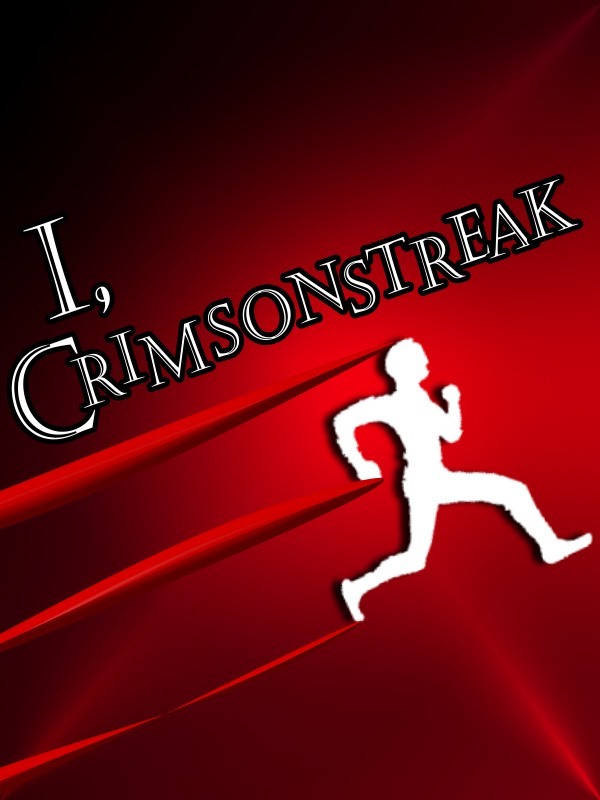 Let's start with I, Crimsonstreak. The book is a first-person account of a super-fast hero whose father takes over the world. How do you know it's a first-person account? Look at the title, silly! It's I, Crimsonstreak!. Get it? Get it? Anyway, the story involves a new, evil empire called the "New World Common Wealth" and the main character's efforts to set the world right. It just so happens that Crimsonstreak's father--a reformed supervillain--has taken over most of the earth while playing his own demented game of Risk. The hero wears red, which I guess is a nod to the Flash. I made these cover concepts three or four years ago. The first one is the first design I came up with and I'm rather fond of it. The stick figure (thank you, clip art!) 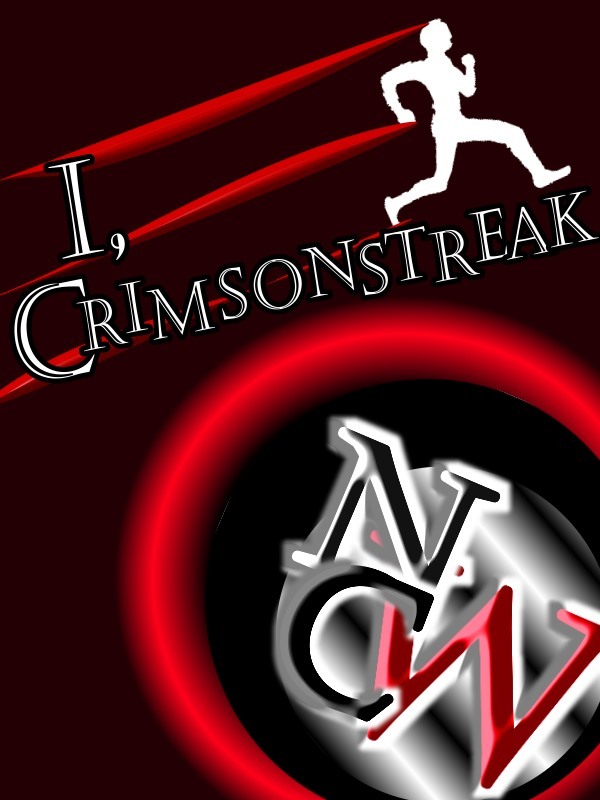 represents Crimsonstreak, the red lines are the red blur you see when he runs, and the circle in the bottom-right is the earth as represented by a logo for the New World Common Wealth (with the "W" doubling as both "World" and "Wealth" in the symbol). There's kind of an eclipse thing going on with the logo, too. The next two designs are just variations on that same concept, minus the NWCW logo. I probably like the one with the box better. This design is a departure from the others. 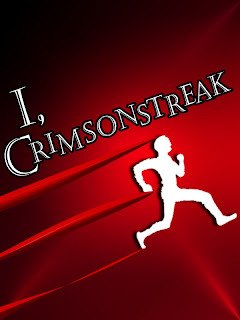 It drops the "I" from the title and simply makes it a lightning-infused "Crimsonstreak" that could be one or two words. 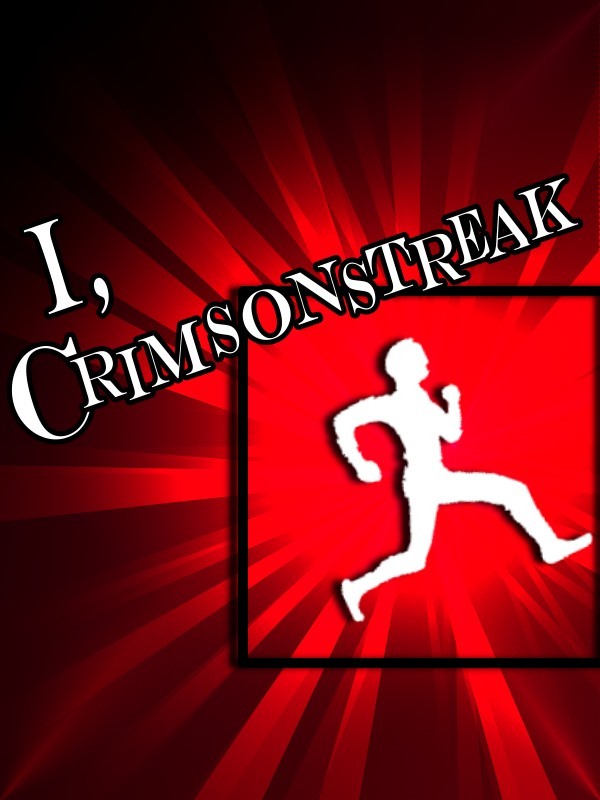 The red streaks return, but the stick figure is replaced with a man running (apparently, his legs are on fire). Another book I designed covers for is called The Franchise. It's about a company called OMNI Corporation, which is kind of Triple-A for city-scale emergencies. 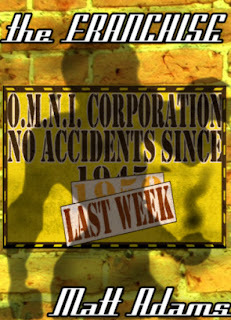 The book is set in the mid-60s in an alternate U.S. and follows the adventures of a nationwide chain of hero-for-hire businesses. 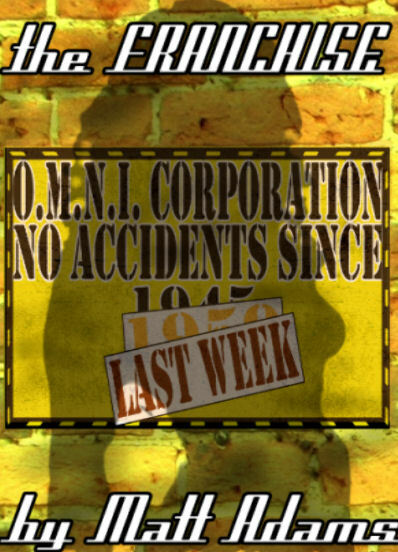 In the story, a workplace accidents sign has a few mentions, and it's a nice little detail that I thought would make for an interesting cover. 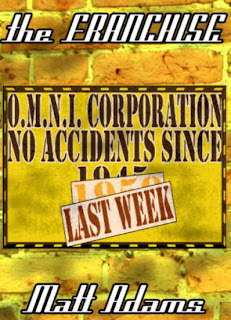 OMNI franchise buildings have yellow-brick exteriors, so that's where the yellow coloring comes from. 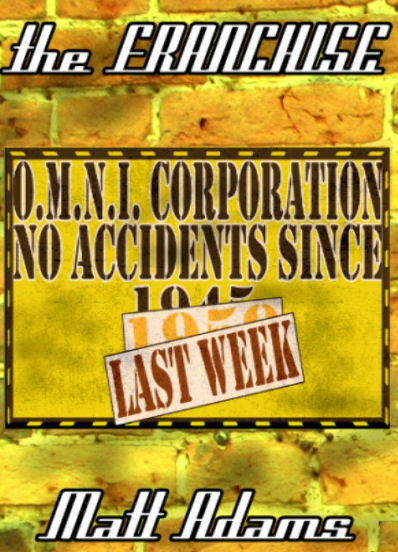 The point of the sign is that workplace accidents are few and far between...but the "last week" is supposed to be somewhat ominous. 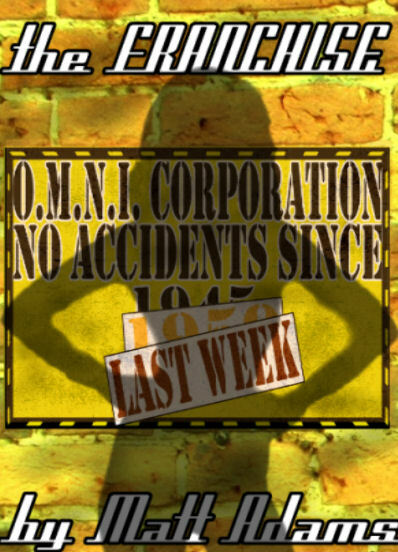 The original concept includes the work sign and a woman's silhouette representing the main heroine of the novel. I'm not much of an artist, so I searched for some pictures and found forms that I turned into silhouettes. Actually, each shadow is a different take on Wonder Woman (thanks, Google images). The first attempt is just okay, in my opinion. The second one is just a variation. That's seriously a silhouette of Linda Carter in her iconic Wonder Woman pose from the TV series. I think she looks too small and am bugged by the fact her shadow covers the author's name. It's not an ego thing...in all the other versions, the shadows do not cover the author's name. I like the third version a lot. The silhouette seems to be well-proportioned and I like the pose. I believe I used a Wonder Woman pic from the Justice League animated series for that one. This fourth version has a couple of subtle changes. I dropped "by" from the author byline...go check out book covers and see how often "by author" appears. I think it looks better without it. The main character has a superpower: the ability to manipulate fire. I airbrushed a little flame coming from her hand...a touch I like. 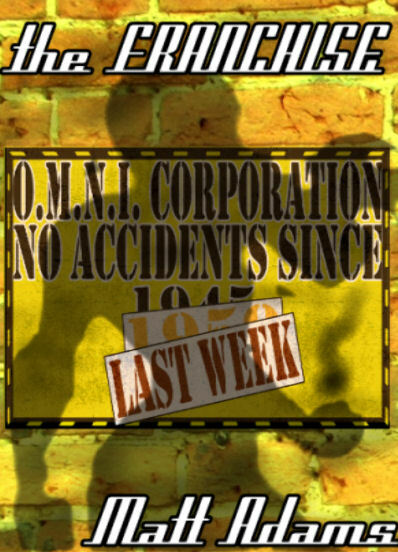 The fifth version of the cover drops the main character's shadow entirely and just uses the OMNI sign. I really like this design (obviously...it was the template for the others). It's simple and makes me wonder, "What's going on here?" If I picked a favorite, it would probably be either the fourth or fifth versions. Of course, as I wrote earlier...all of this is a moot point. If either of these books ever gets published by a major house, you can bet the covers will look absolutely nothing like the ones I've shared with you today.